Follow your nose, and you may find a suspicious spot. Maybe your new pet hasn't learned to find the litter box or to wait until they are walked. Even pets we've had for years can suddenly have an accident indoors on the couch or the middle of the carpet. 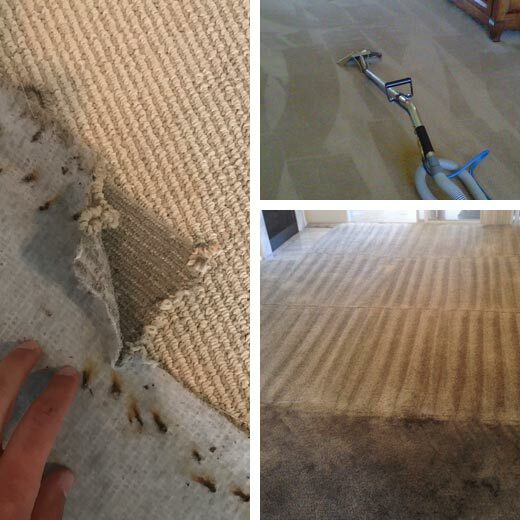 DC Carpet Cleaning knows the best ways to treat carpet and upholstery pet stains. Our methods remove urine from the fibers, so that the stain and odor are gone. It is really hard for the pet owner to remove pet stains completely, and you do need to remove them completely. Even a trace odor can confuse your pet and cause them to have an accident in the same spot. Pet urine goes from acidic when fresh to alkaline when dry. This means that fresh stains need a different treatment than older stains. Professionals know what to do, and when, for the best cleaning results possible, with no damage to your carpet or upholstery. Steam cleaning is awesome for a lot of cleaning and disinfecting, but don't try it with pet stains. The heat can actually set in the stains, which is the complete opposite of what you need! Our technicians use products especially designed to break down the salts and chemicals in urine so they can be completely removed from the carpeting. DC Carpet Cleaning has the solution for smelly pet stains. With a combination of expert cleaning, sanitizing and deodorizing, we can safely remove pet urine stains, leaving your home fresh and clean.